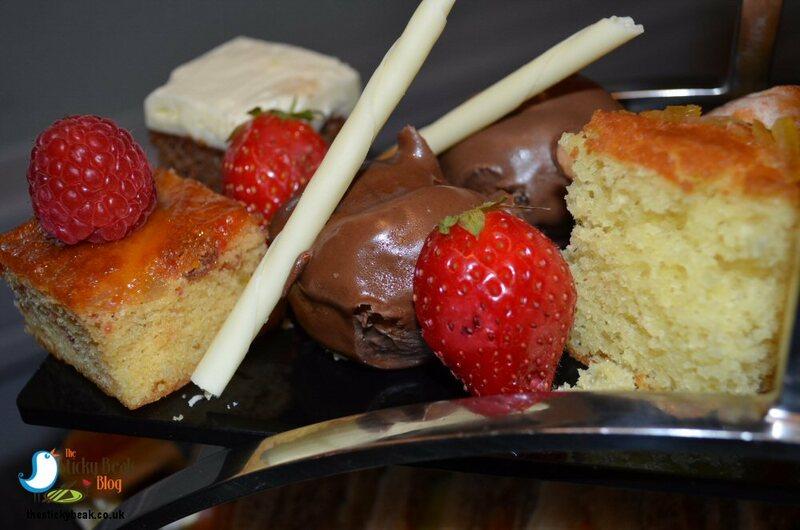 With National Afternoon Tea Week rapidly approaching we are getting still more requests coming in to review venues; I know, tough job isn’t it?! The Man Bird and I found ourselves back in Nottingham, this time at the rather swanky Crowne Plaza Hotel’s Swatch restaurant, sampling the wonderfully named Royal Afternoon Tea (£19.95 per person). Swatch is located on the first floor of the Crowne Plaza, a floor up from main reception. 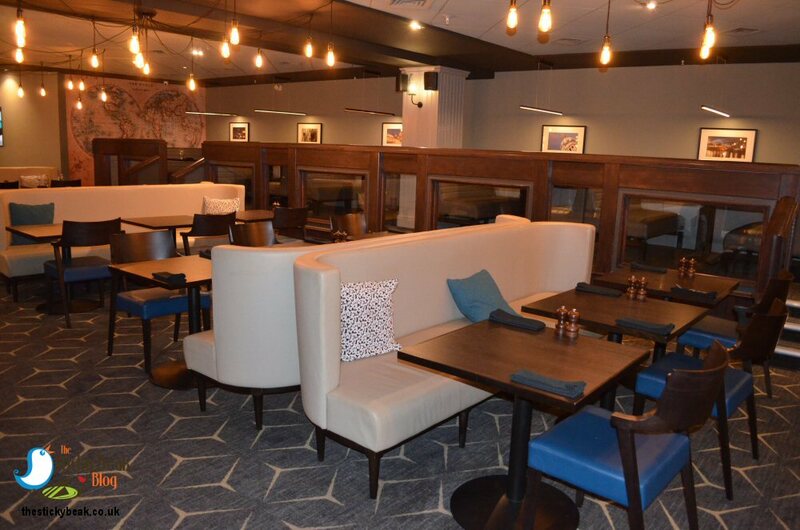 Valor Europe, who own the venue, have recently invested in upgrading all the facilities and decor and it looks more than a little fabulous in the restaurant now. 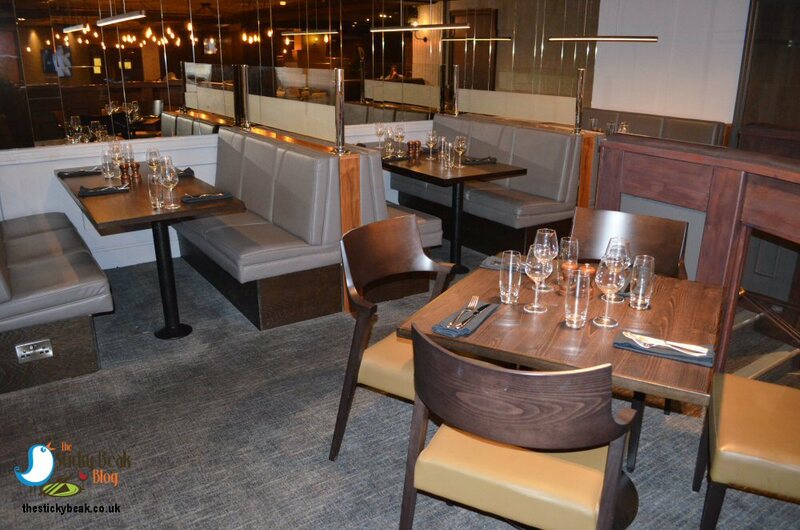 The large, open-plan space is given interest with elevated areas of booth type tables, pillars, and feature “cobweb” style lighting arrangements that fan out over the lower tables. On the walls are banks of pictures depicting various historical Nottingham landmarks; our table had the iconic Castle on its wall space. A lovely flame-haired young lady named April was our server for the afternoon, and took our tea order after we were settled in nicely. Twinings teas are served at the Crowne Plaza, so I had Darjeeling, His Nibs had Earl Grey; both were served in lovely large white pots, with corresponding jug for the milk and saucer for the Lemon slices. Before the Afternoon Tea platter was brought out, we were served the Chef’s Welcome; a slate laden with Champagne Sorbet and Chocolate Macarons – yummy! The sorbet was served in dainty shot glasses and had a gorgeously floral taste that was clean and lively on the palate; perfect to start the experience with. One of my favourite things is Macarons, and the one at Crowne Plaza’s Swatch restaurant had a beautifully light crisp shell that was filled with a wickedly deep centre of rich ganache. It really was superb . 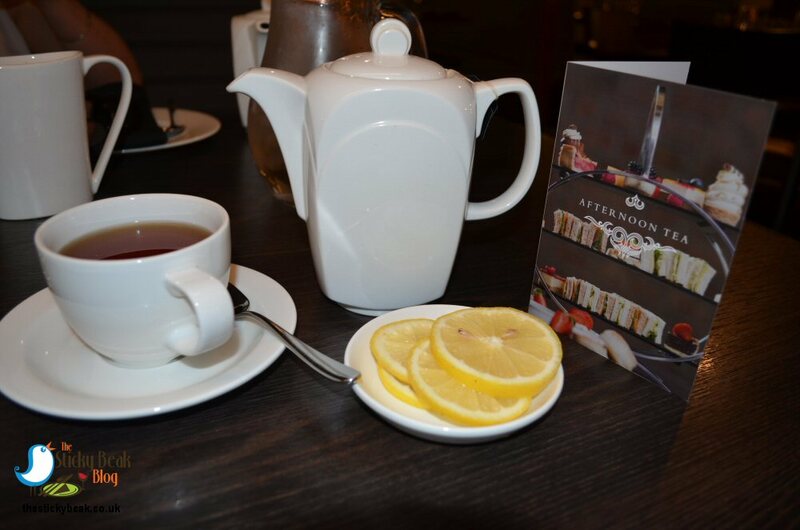 There are three Afternoon Teas to choose from at Swatch, Crowne Plaza, Nottingham; the Royal which we were sampling at £19.95pp, a Prosecco Sparkling Afternoon Tea at £24.95pp, and the brilliantly named G and Tea Afternoon Tea at £27.95 pp. Each option is only available by pre-booking (payment in full at time of booking) and is for a minimum of two persons. 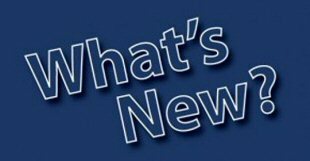 If any food allergies or intolerances are known, then please inform the team at the time of booking and alternatives can be arranged. One member of the team cleared our slate platter away as another colleague served the three tier art-deco inspired stand to us. I racked my brains as to where I’d seen this stand before; it took me a while, but I remembered that it was at The Orangery at St Elphins Park! Style-wise this has been my favourite stand; sleek and shiny and uber-classy. 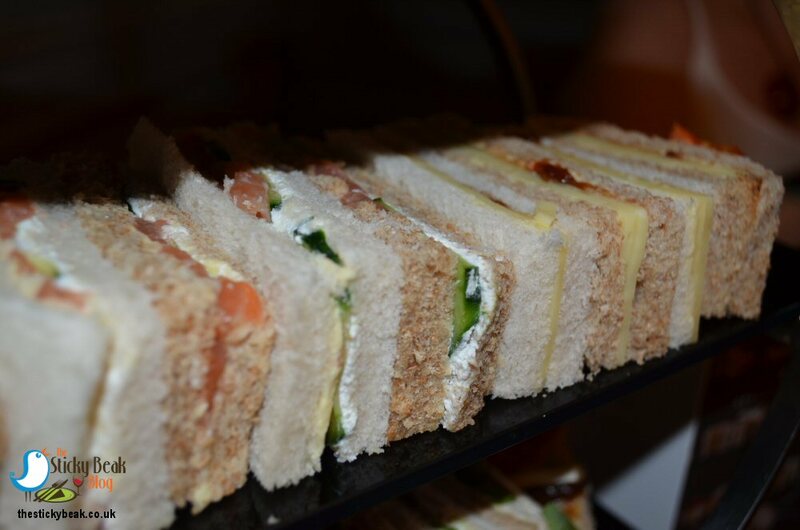 The bottom two tiers were absolutely crammed with fingers of white and wholemeal bread that were filled generously with an assortment of delights, book-ended by miniature square sandwiches. His Nibs tucked into a Mature Cheddar and Pickle sandwich as I reached for a Scottish Smoked Salmon, Cucumber and Lemon Cream Cheese number. The Salmon slices were incredibly thick with a superb succulence to them and an equally wonderful flavour. The slices of cool, crunchy Cucumber added a textural contrast to the silky smooth fish and a delicate citrus whisper came via the Lemon Cream Cheese. His Nibs was really enjoying the punchy mature Cheddar in his sandwich that had been paired with a chunky, tangy pickle; this classic combo needs little else adding to it, it can just stand alone. The key to simple fare though is that the quality has to be there; any flaws can be ratted out straight away as there’s nothing to hide behind. In this case, quality was in abundance; from the fresh springy bread, the thick slices of tangy cheese and the piquancy of the pickle – everything was as it should be. Our curiosity had been piqued by the tiny square sandwiches, so that’s where we turned our attention to next. As we picked them up gentle warmth emanated from them and then the delightful smell of creamy Brie wafted up to our nostrils. 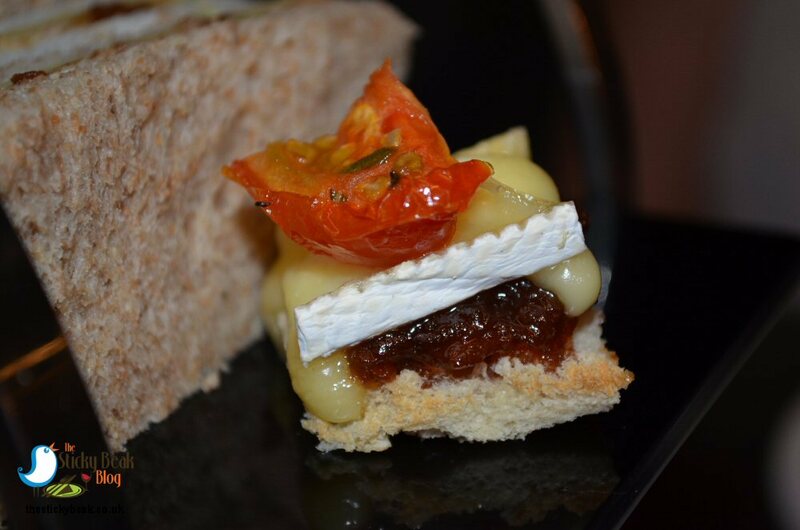 To our delight, the Brie had just begun to soften which brought its creaminess to the fore and the intense taste of the sweet vine Tomato popped out against it. Tangy-but-sweet Red Onion Marmalade added a soupcon of texture and smokiness to this small but mighty morsel. The final sandwich to try was the Rosemary Chicken with Pesto Crème Fraiche and Wild Rocket, and this was another generously filled number. Good job The Boy Wonder and I had brought our appetites with us! Delicately herbed Chicken breast meat had been generously sliced and laid on an Emerald-hued bed of Peppery, young Wild Rocket leaves, which had a wonderful visual impact. Dots of Pesto with its bright Basil notes had been placed along the bread fingers, and it added a beautiful vibrancy to the sandwich on the palate. With two of the three tiers now looking forlornly vacant The Man Bird and I were thoroughly warmed up and in the zone for more gluttony. 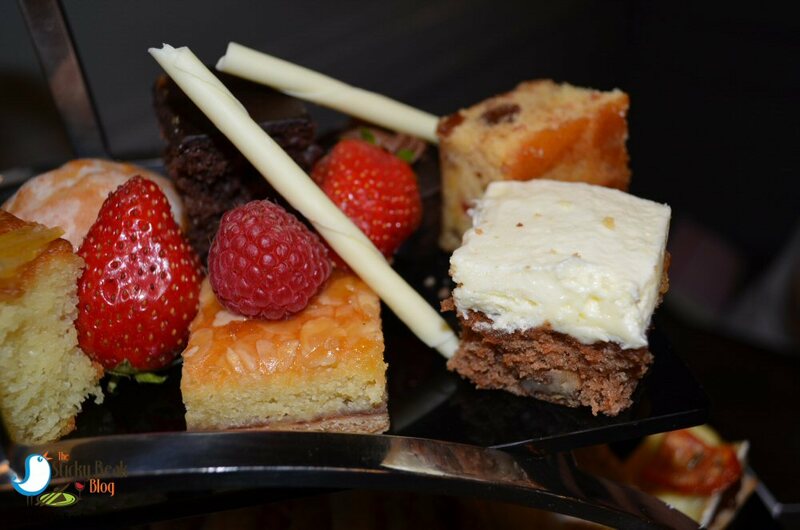 Just as well, because there was no shortage of choice in the assiette of cakes and sweet treats! We kicked off the cakes with a cheeky Carrot Cake square. This was brilliantly light in texture, and nice and moist in the mouth, as well as being pleasingly spiced. A gorgeous cream cheese frosting layer nestled on top; this imparted the perfect tang to counteract the cake’s sweetness, achieving a perfect harmony of tastes. Fancy elongated curls of White Chocolate, slices of seasonal Strawberries, and whole Raspberries decorated the top tier of the stand and at various intervals we nibbled away at these too. The White Chocolate was exceptionally creamy and melted instantly in the mouth; its mellow creamy notes seemed to enhance the fruity bouquet of the fresh fruits. Chocolate cake slices were beckoning to us and it would’ve been very rude of us to ignore them, so we tucked in to their dense cocoa delights without any further ado .The texture of this cake is possibly the lightest, airiest that I’ve ever encountered; so fine was it that cutting it almost made it disintegrate into a myriad of incoherent crumbs! I had to proceed with caution as I split it into half – I think I am now a fully-fledged cake surgeon! The Cherry and Sultana slice had a lovely amount of fruit in it and a sugar glaze on its top that necessitated some serious licking of fingers, as did the individual Vanilla sponge cakes. I was impressed with the Bakewell slices too; the pastry base was joyously buttery and had a generous layer of Raspberry jam on it. The Frangipane layer was light and springy and scattered with crunchy flaked Almonds which gave some texture to this sweet treat. 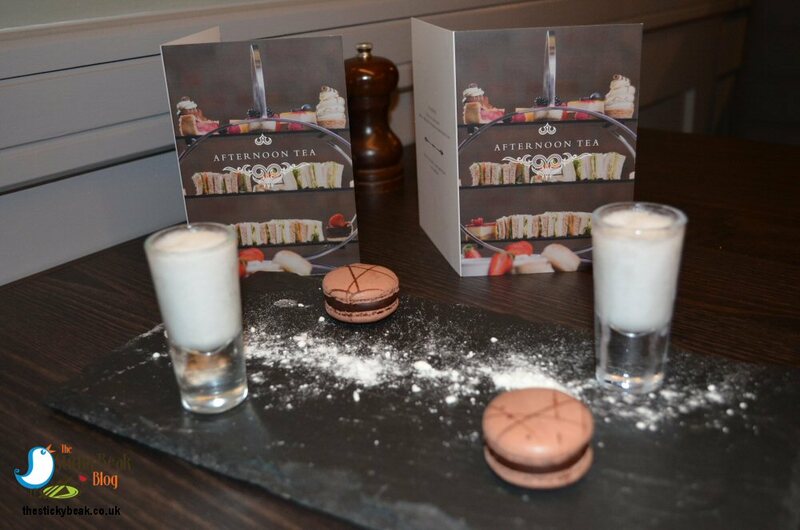 The Swatch restaurant Chef had included Profiteroles on his Afternoon Tea menu – hurrah! 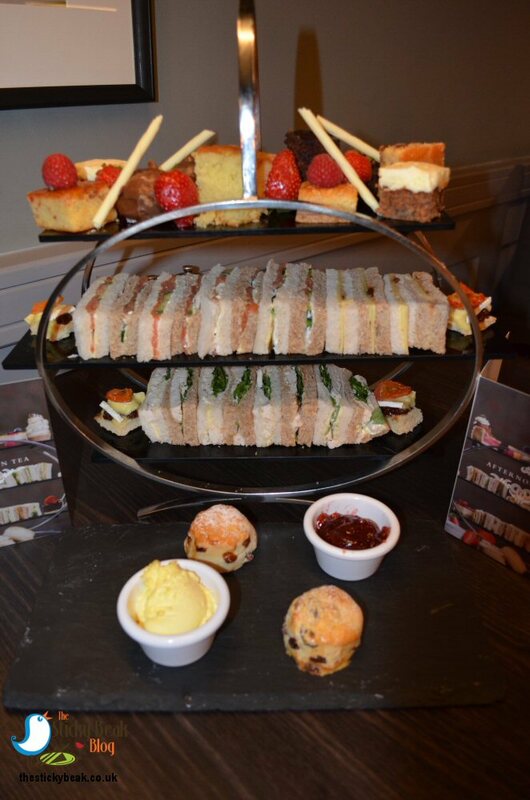 I think this was the first venue to have done so, and I hadn’t realised how much they merit a position on any Afternoon Tea platter until now. The Choux pastry buns had been bathed in a layer of fine milk chocolate and then filled with an extremely aerated cream filling that was as light as a cloud. Seriously, more Afternoon Tea platters should have Profiteroles on them – they were gorgeous, and very moreish. Our palates needed a respite from chocolate so we bit into fingers of moist, gooey Lemon sponge. This was so moist, thanks to the lake of lemon syrup that had been drizzled into it, and this sharp citrus element was further enhanced by the strips of Lemon peel on top of the cake. A more vibrant, zesty cake you couldn’t wish for; it was the perfect antidote to all the richness we’d had so far. “Once more unto the breach” someone once said, and so we dived into what I can only describe as Chocolate Paradise. Is it Ganache? Is it Mousse? Is it very gooey Brownie? Quite frankly, we didn’t care! All you need to know dear reader is that it was rich, uber-chocolatey and totally addictive. If I could’ve, I would’ve kidnapped the pastry Chef and made him make this for me every single day. All that remained (thankfully, as my elastic waistband was pretty much at its limit!) 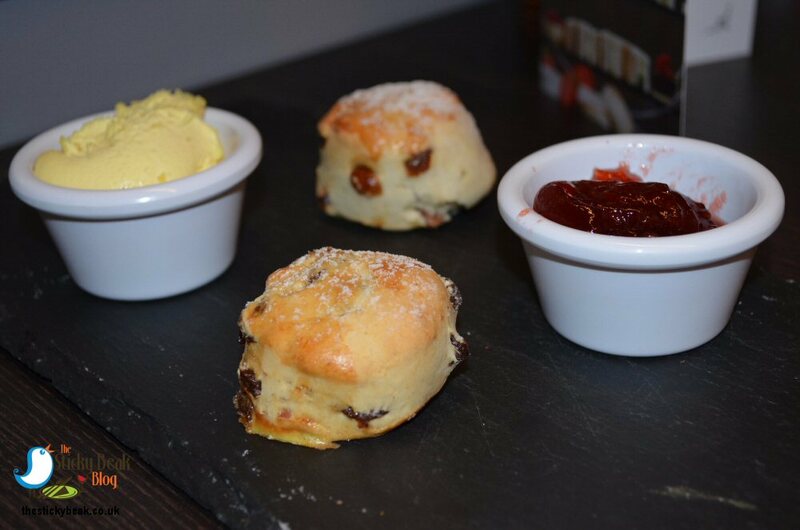 was the fruit scones with pots of Clotted Cream and Strawberry Jam. The scones had a nice texture to them when cut into, and plenty of plump fruit inside. 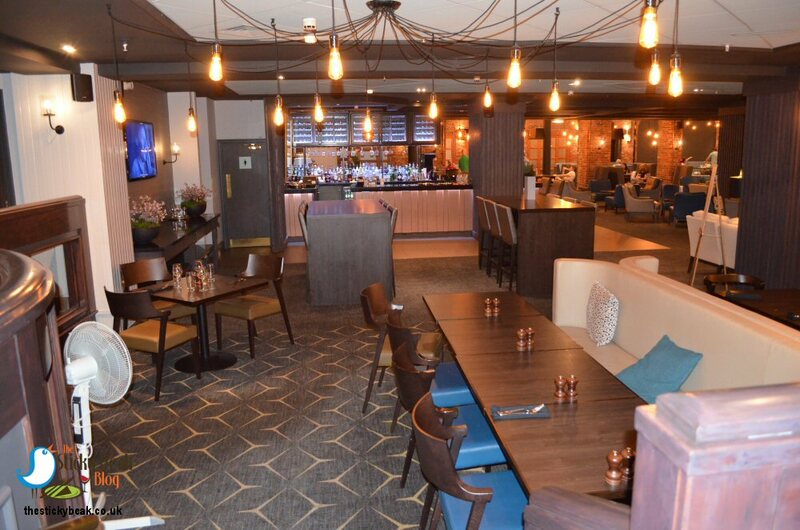 As you might expect from a high-end hotel such as the Crowne Plaza, nothing is skimped on – including the portion size of clotted cream and jam for the scones. His Nibs and I must’ve piled on at least 1.5” of cream per scone half and topped it with a massive dollop of jam! Cream moustaches ensued: gluttony 1 – decorum 0. 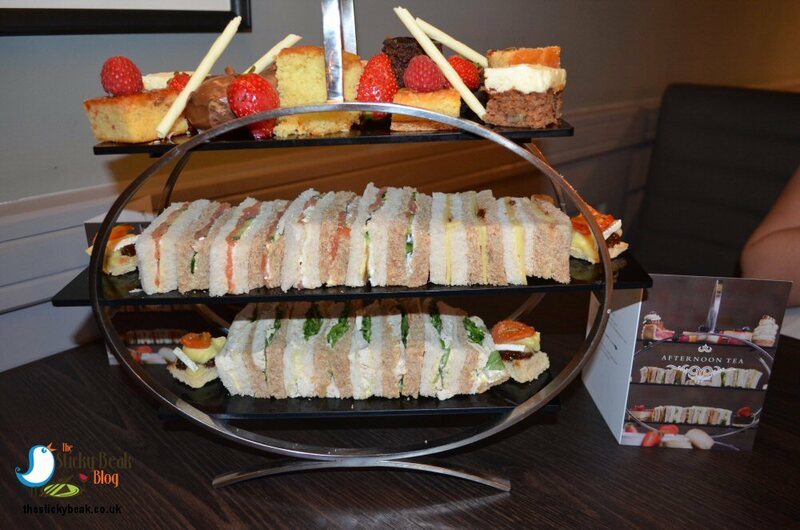 If you’re a fan of Afternoon Teas it’s definitely worth coming and indulging here at Swatch restaurant in the Crowne Plaza hotel at Nottingham – bring your appetite though! The Boy Wonder and I had a fab time with this team, Hot Wings happily awarded.